I brought this for my hubbie as he is a big action-horror fan. I watched it with hin also as I am a big Kevin Mckidd fan. 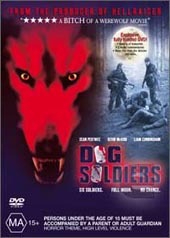 The movie reminded me of a english version of predator, but the wolves were a little less believable. It was an entertaining movie, plenty of blood and guts, gun-fire and army type language. I don't think it could be classed as a horror though. The special features were great-especially the Gag reel!! !